Penn guard Ashley Russell grabbed a rebound, then looked ahead to see teammate Tori Crawford streaking ahead of the defense. Russell found her teammate, who laid the ball in to put the Quakers up 37-18 on Harvard midway through the second quarter. It was the Quakers’ seventh straight make to start the second quarter, and Penn never looked back, going into halftime with an 18-point advantage and extending it to as many as 30 points in the second. 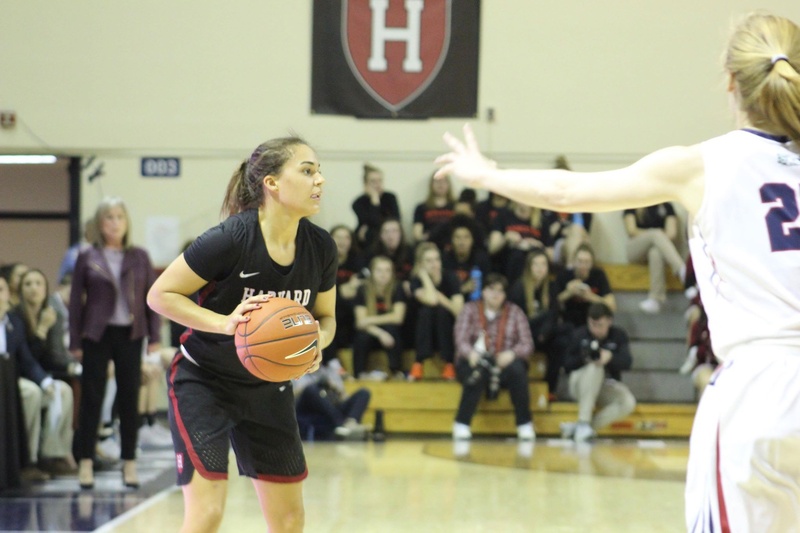 Harvard (16-13, 9-6 Ivy) dropped its semifinal contest against Penn (24-5, 13-2) 91-62 at the Lee Amphitheater this past Saturday night, exiting the Ivy League Tournament in the semifinals for the third consecutive year. Despite boasting one of the best defenses in the country, it was the Quaker offense that was the star of the game tonight. Shooting 54.4% from the field and having five players score in double figures, Penn’s offense was seemingly unstoppable. The Quakers scored over 20 points in every quarter, and dominated the game from start to finish. It was not supposed to go this way. The first two matchups between Harvard and Penn went to at least one overtime, with the Crimson sneaking past the Quakers in double overtime in Cambridge before Penn returned the favor in an overtime win at the Palestra a few weeks later. Both teams expected another close one on Saturday night, but it was clear pretty early on that this night was going to be different. After Harvard took its only lead of the game, Penn went on a 12-0 run to end the first quarter, then hit another three to start the second to push its lead to 24-10. The Crimson never got close after that. For a brief moment at the start of the third quarter, it appeared that Harvard might yet get back into the game. It forced a steal, leading to a three from junior guard Katie Benzan — who ended up leading the team with 12 points — to cut the lead to 15. When the Quakers turned the ball over a second consecutive time, it seemed as if the tide was changing. But Penn quickly regained control, scoring 11 of the next 14 points to push the lead to 23 and eventually extending the margin to 26 at the end of the third quarter. Russell led the way for the Quakers, scoring 20 points and adding four assists as she looked in control of the offense throughout. In the fourth quarter, the desperate Crimson resorted to playing more physically and to taking more risks defensively. Harvard committed 13 fouls in the fourth quarter, leading to 17 Penn free throws. With frustration mounting, senior guard Nani Redford committed her fourth foul in the backcourt with 3:23 to go, then slammed the ball on the floor out of frustration. The referees gave Redford a technical foul, ending her night and her Ivy League career and serving as a fitting coda to a bitterly disappointing night for the Crimson. Harvard will await word on whether it will participate in an invitational tournament in the upcoming days.